The Rees & Sumach Community Garden has plots available. Applicants will be assigned plots on a first-come, first-served basis. 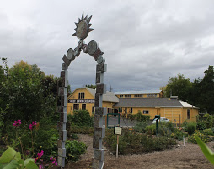 The Rees & Sumach Community Garden is located at the corner of Rees and Sumach streets on land donated by Whitman College, and features 35 individual plots, most of which are 10' x 20' and all are at least 200 sq. ft. each. The garden also has several common areas where produce is shared among all the gardeners. Applications should be sent to Rees & Sumach Garden at PO Box 1222, Walla Walla, or delivered to 717 N. Main. See the link on this page to our Application Form. The garden is sponsored by the North Main Area Neighborhood Association, as well as Walla Walla 2020. This site features garden progress and rules, information on membership and sponsorships, and useful links to other community gardens and associations. Garden membership includes access to a listserve for sharing gardening questions and information. For more information, contact Andrea Workman, 876-2999, piksaki@yahoo.com, and see the links in the right-hand column above for application forms, sponsorship, garden rules, and links to other gardens and groups.